The last time I saw Alkaline Trio was earlier this year on the Cleveland stop of The Occult Roots of Alkaline Trio: Early Songs for Eerie People Tour. The show was in the Agora Theatre and was packed with hundreds of kids. The concert was a special one as the band performed their first album, Godamnit, in its entirety as well as a few other choice cuts from their extensive discography. I remember sitting high up in the nosebleed section sipping on a PBR tallboy with a colossal grin on my face grasping onto every word that Matt and Dan spilled. I recall glancing over the railing and viewing the eccentric crowd frantically pouring their hearts into these gentlemen's songs -- my stomach became queasy as I thought of how significant the band as become. It could have been my fear of heights that struck the unease, but I have a feeling it was my selfish attitude that pondered how I would never get to see this band in a minute and intimate setting ever again. My pessimistic opinion was hastily forgotten as the band put on the type of paramount performance I have witnessed from them in doses over the near decade I have been an adamant fan. However, deep inside my urge to see them in front of a hundred fans instead of a thousand still existed. A past Tuesday I had the pleasure of seeing one-third (or one-fourth, depending how you look at it) of ALK3 at a miniscule hall/bar with roughly 50 other people. 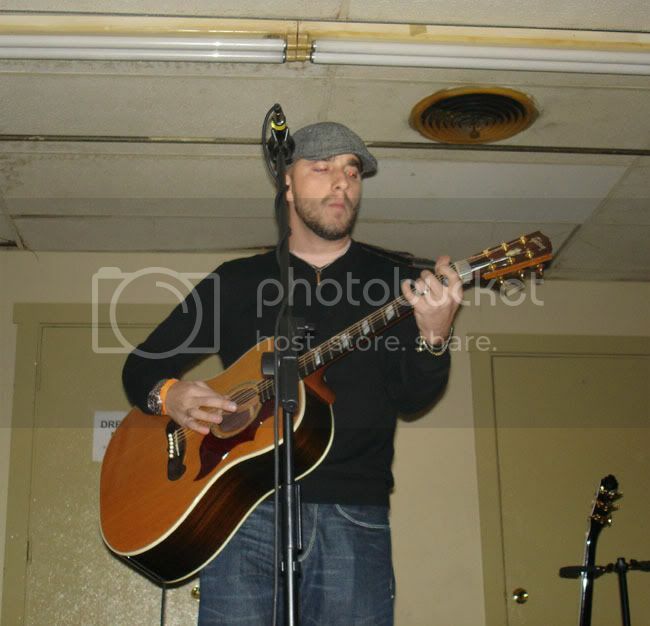 Dan Andriano took the stage at the Lawrenceville Moose in a strikingly different demeanor, trading makeup and an all-black attire for a pair of jeans and a casual sweater, while sporting a classy hat and his young face protected by a beard. In fact, Mr. Andriano only vaguely resembled a punk rocker, instead reminding me of a Caucasian version of another Chicago icon, Common. Dan's soft voice nervously greeted the petite crowd who warmly welcomed him back to Pittsburgh, a place the Trio have not stopped for approximately two years. He struggled with tuning his guitar after opening with the Alkaline Trio track "Blue Carolina" and exemplified a bit of detestation towards the venue's sound crew. I told him to use his beard to tune his guitar; he admitted it possessed magical powers and from there on out the show went smoothly. Mixed amongst acoustic interpretations of his songs from ALK3 were a handful of new songs, a cut from his solo split with former Trio / Smoking Popes drummer Mike Felumlee, and a few covers. Dan declined -- despite vigorous pleas -- from my friend Ehryn and I to play some material from Tuesday. However, we almost convinced him to stay in town one extra night -- as in order to spend some time with Brendan Kelly and Neil Hennessey, as the Lawrence Arms were in town the following evening and a chance to hear the Falcon would have arose. He used some excuse about HAVING to play in Cleveland the next day, pfft, terrible excuse. The crowd was ecstatic and their collective voice nearly encompassed the soft resonation of Dan's on familiar cuts such as "Blue Carolina," "Emma," "Crawl," "Maybe I'll Catch Fire," and "Every Thug Needs a Lady." Early during the set Andriano entertained our eardrums with a faithful cover of Simon & Garfunkel's "The Only Living Boy in New York" as well as songs from Elvis Costello and Billy Bragg. Throughout the evening Dan appeared to be a bit bashful, but maintained a bit of quick wit between songs that pulled some laughs from the fervent group of onlookers. His voice corresponded with his reserved posture, as it was yielding and gentle. Dan does not possess a very commanding vocal style, but his tender technique succeeded tremendously in the solo setting. Evidence of this was emphasized on "Way Too Many Times," the lone song to appear from his solo split. I was staggered that no one was singing along, assuming diehard fans would have that record. Disappointment struck me when "Lucky Smoke Rings" or "Let the Stars Play" were not performed (as they are equally superior songs). 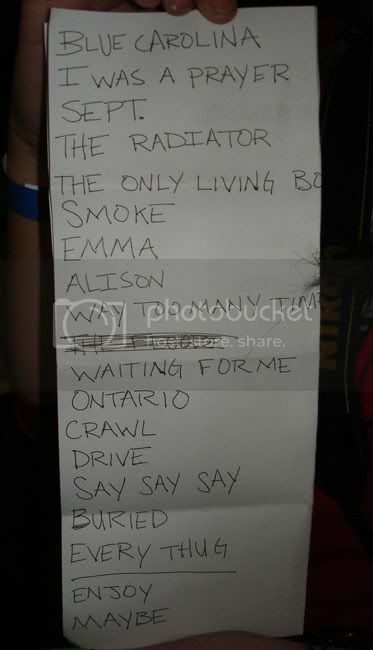 Some of the new songs that Dan performed stayed in the same vein as those previously mentioned tracks, but boasted a stronger musical presence as if they were not scrapped Alkaline Trio songs. "Enjoy Your Day," which appears on the Trio record Goddamnit, closed the evening appropriately. Dan avowed that the song was one of the first he wrote for the band and thanked the crowd for their support before tackling the number. On the aforementioned Occult Roots Tour, Dan executed the same song in the lone spotlight with his acoustic guitar atop the massive stage. I recall thoroughly enjoying its deliverance, however, after hearing the song standing inches from Dan as opposed to the rafters of the Agora gave this occasion an overwhelming and unparalleled sensation. My chances of ever seeing Alkaline Trio in a small intimate setting again are slim. In spite of this, Dan Andriano's solo performance delighted my spirits so well in said setting that my fantasy can be forgotten without regret. * - Note: These songs were recorded on a Sony Cyber-Shot W1 still camera, so the quality isn't amazing, but it gets the job done.